An irresistible programme of baroque masterpieces performed by the peerless Dunedin Consort. Bach's B Minor Flute Suite is full of sparkling dances and rich sonorities and his Cantata 'ich habe genug' is hauntingly beautiful. 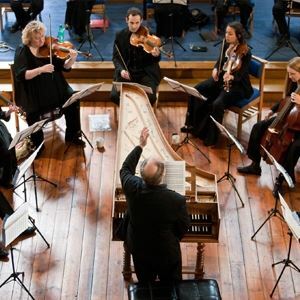 No composer can lift the spirits like Handel, and his Water Music, written to be played on a barge on the Thames, is so full of energy and joy it will send you tapping your toes into the evening.